There are five bodies on stage, encased in plastic. The opening of the Northern Ireland Opera/Lyric Theatre co-production of Sweeney Todd is like a scene from a Scandi Noir drama. 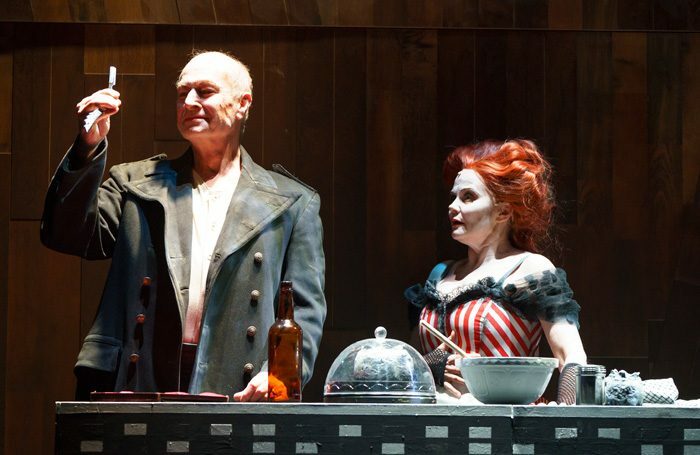 Performed on a bare stage with high wooden walls, Sondheim’s story of a man returning from exile seeking revenge for the loss of his wife started life as a gory cautionary tale in the penny dreadfuls. There are nods to this in the restrained colours of designer Dorota Karolczak’s costumes and Wolfgang Gobbel’s moody, gloomy lighting which casts gothic shadows on the walls and (rather too often) throws characters’ faces into darkness. Director Walter Sutcliffe occasionally casts a contemporary eye across this Victorian melodrama through his suited and booted chorus and unexpected use of colour. Walls are washed in red as blood is spilled, and shimmer with blue as Mrs Lovett dreams of a future by the sea. This meeting of past and present serves to underscore our undying fascination with blood and gore.